A schoolwide tournament ending Thursday at Concordia Elementary School boasted enough participants to make it one of the largest know school tournaments in the nation. Originally, 200 students - 30 percent of the entire school - from grades 1-6 started in the competition, a probable record-setting number. According to tournament organizer Eric Hicks, a San Clemente resident who volunteers his time to teach chess at local schools, Berkeley has the largest afterschool chess program in the nation, with 750 students, but its tournament only drew 20 entrants. "We had 10 times as many in our very first tournament," Hicks said. Elimination rounds narrowed the competition to 16 students in grades 1-3, and 16 in grades 4-6. On Wednesday, the upper-grades played their final rounds, and the lower grades battled it out on Thursday. "It's hard playing someone from your own room because you don't want to eliminate them," said third-grader Andy Schuster, who reached checkmate in a game with classmate Wesley Ender. 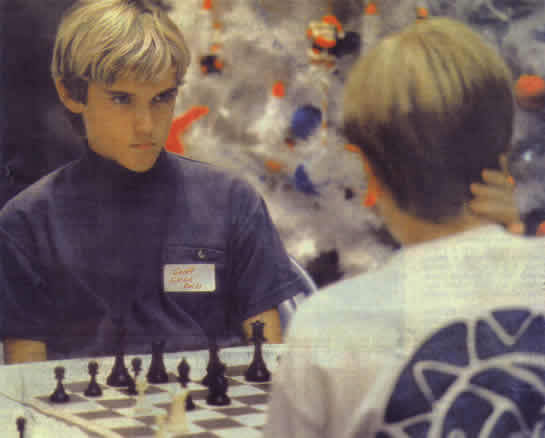 The moves were documented on large magnetic chess boards, and more than 100 students from the competitors' classrooms were invited to watch. Hicks took time during the tournament to explain the moves to the group and ask what they mean - reinforcing their knowledge. He also brought travel-sized chess games for all the finalists. Also on hand both days was World Class Chess player Marc Leski, an International Master who won the 1993 European Cup, the 1983 French speed chess championship, and a member of the French international team. Leski, a computer software programmer, moved to San Clemente 10 days ago. Leski, who learned chess at age 14, thinks it is good for children to learn the game at an early age. He also said it provides analytical and critical thinking skills without coming across as another grade-oriented subject like math or science. "If nothing else, it gives them more self-confidence," Leski said. "The beauty of chess is that there is an infinite amount amount of things you can learn. These kids have an intense passion for the game. That's more important than anything else as far as I'm concerned."